The smaller size and lower inertia of MAVs makes them more maneuverable and agile than full-scale helicopters. Another way to say this is that control and stabilization of MAVs is a more challenging task than that of full-scale helicopters. Additional requirements like control and navigation in constrained environments, and low weight and size of the avionics package makes this problem even more difficult. Indoor autonomous flight control of MAVs involves several challenges including state estimation using lightweight sensors and implementation of high bandwidth control. 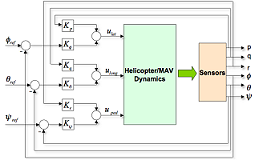 The objective of this research task is to conduct experimental and analytical research activities to develop a controller for autonomous hover and basic forward flight of a MAV. 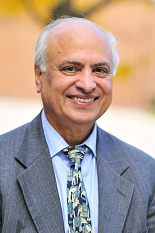 The Giant MAV developed at the University of Maryland is the test-bed. The control scheme consists of an inner attitude stabilization loop (higher bandwidth) and an outer translation stabilization loop (lower bandwidth). The work so far has concentrated on development of the experimental setup and implementation of the attitude stabilization loop. The schematic of the control system is shown in Figure 1. In order to move from a basic PD based controller to a more advanced model based controller, a theoretical nonlinear model of pitch and heave has been developed from first principles. The first generation system is an onboard stabilization unit weighing 30 grams, and consisting of two PIC 18 microcontrollers, an IMU (inertial measurement unit), and a wireless transceiver. The IMU consists of 3 gyroscopes, 3 accelerometers and 3 magnetometers. The attitude of the MAV is estimated through these sensors and actuator commands computed onboard as per the schematic shown. The transceiver receives commands from the ground and also sends telemetry data back to ground. This system had several drawbacks. The onboard microcontroller needs to be reprogrammed every time the control or attitude estimation algorithms are modified or debugged. These algorithms must be optimized before testing due to the onboard microcontroller’s limited processing power. Such an onboard stabilization system would be ideal for the final implementation on an MAV, but a more flexible setup is desirable for easier and faster evaluation of various schemes and algorithms. In the second generation, the data processing has been taken off Giant and is now done on a laptop using an in-house virtual instrument developed in LabVIEW. The sensors, strapped to the vehicle, transmit the raw data to ground using a Bluetooth transmitter at 57.6 kbps. This data is processed on the laptop and control commands are uplinked to the vehicle through a standard RC transmitter-receiver. Accurate state estimation of the flying vehicle is the key to its precise control. A new IMU has been obtained with higher quality sensors than the original IMU for the second generation system. This IMU uses the single IC triple axis accelerometer from Freescale (MA7260Q), 2 IDG300 dual axis MEMs gyroscopes and a dual axis Honeywell magnetometer. The old IMU was supposed to be 10-bit but only gave 7-bit digitization of sensor data. The new IMU is supposed to be 10-bit and actually is. This allows for a finer attitude hold. The old IMU gyroscopes had a range of ±150º/s. This range made them susceptible to saturation due to vibration. The attitude computed from the three gyroscopes provides a good estimate of high frequency dynamics, but are prone to drift. The gyroscopes have been calibrated using a turntable. The gyroscopes were rated for ±300º/s. The turntable showed them to be linear to ±600º/s. So, saturation due to vibration is no longer an issue. The accelerometers provide low frequency attitude estimation by measuring the gravity components. 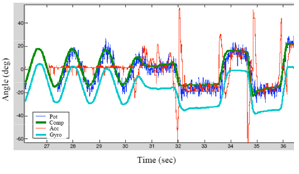 However, accelerometers are sensitive to vibrations and translational accelerations. A complementary filter is used to fuse the low frequency accelerometer data with the high frequency gyroscope data. Proportional and derivative gains have been experimentally tuned by flying the vehicle using the 2nd generation system. A modified Ziegler-Nichols tuning method was used. Modified ZN tuning means to stabilize pitch (best known setting), then ZN tuning on roll for “better stability” (half of critical gain), then repeat for pitch and iterate till convergence is reached. The system allows the vehicle to hover autonomously (pitch, roll and yaw) for over 100 seconds. The vehicle does not yet have translational feedback so it does drift in space and eventually runs out of room inside. The system goal holds the vehicle within ±0.1 radians of its hovering trim attitude. This can be seen in the flight from 30 to 35 seconds (before this the vehicle throttle is being turned up for takeoff). Flight tests were conducted inside but in order to get a feel for how it might respond to wind gusts, large perturbations were provided to the system. This was done by slamming the longitudinal stick input down for an instant so the vehicle pitched down as seen at 36 seconds. The system restores vehicle stability as seen in the flight plot without the pilot needing to do anything. The system allows the flight dynamics model to be validated. The flight dynamics model has been refined as it now includes the flybar. Rotor cyclic inputs are physically through flybar flapping due to flybar cyclic pitch (the vehicle does not have direct cyclic input to the main rotor). A comparison between predicted pitch and measured pitch values is shown in Figure 8. The estimated pitch moment of inertia was too large to compare measured and predicted pitch values. The first goal is to see if the model captures the proper trends which it does. After this, pitch rate magnitude will be examined more closely. First, the pitch moment of inertia needs to be accurately measured using a trifilar pendulum. 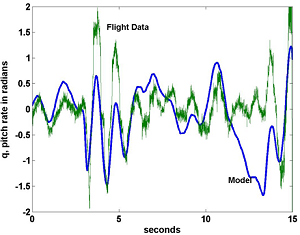 The flight dynamics model has been expanded to include lateral flight dynamics but a comparison has yet to be done. The system can be used to validate and refine the flight dynamics model for both pitch and roll. The next flight testing step is to have the vehicle hold an attitude away from hover attitude. Also, the vertical accelerometer should allow for heave motion to have velocity feedback provided. That would aid in piloting the vehicle as piloting effort is needed for holding altitude by adjusting the throttle. It may also be possible to use the accelerometers not only for low frequency attitude feedback but also for limited velocity feedback.